While Agua de Jamaica is fantastic on its own...flavorful with health benefits...it mixes up perfectly in a cocktail, too Dani. I apologize for the quick posts this weekend...unless you're enjoying the quickies, in which case, I do what I can...I've been dealing with some sort of "bug" that is ravaging my sinuses and internal functions, so I'm just pulling out some photos that have been waiting in the wings...for their moment in the spotlight. Just looking at the computer screen for this short amount of time has made me dizzy all over again...ugh. Mommy. Place all the fruit in the bottom of a pitcher and pour liquids over. Stir and refrigerate until very cold. Serve over ice. Rub rim of each glass w/ a lime quarter. Spread chile salt on small plate and dip each rim into the salt to coat. Set glass aside. Mix all the liquids together and chill thoroughly. Fill glasses with ice cubes and pour margaritas into prepared glasses. Garnish w/ lime. In a saucepan, bring the water and sugar to a boil over medium-high heat, stirring to dissolve sugar. Let syrup boil for ~3 minutes, or until sugar is thoroughly dissolved and syrup is clear. Remove from heat and cool eopletely. Add lime juice a little at a time, stirring constantly. Transfer mix to jar w/ tight-fitting lid and refrigerate for up to 5 days. Mix together in small bowl. Use right away or transfer to jar w/ tight fitting lid and store at room temp. Sorry to hear you're not feeling real great! Hope your back to yourself in no time. 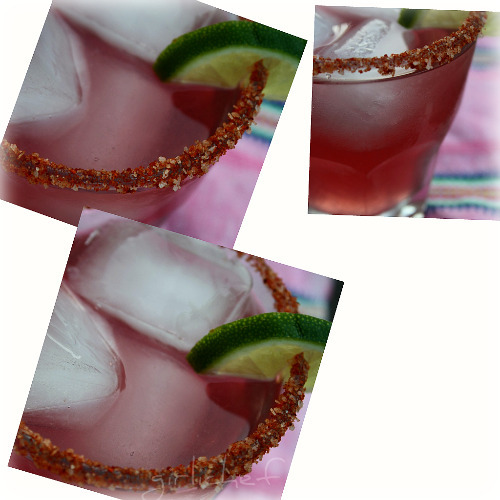 This drink with the chardonnay and the chile salt seems like it would do wonders for your health ;-) Looks delicous! You know, I hear tequila is really good at curing illnesses. Just take a few shots and you won't even remember that you're sick! Seriously though feel better! This looks so refreshing. I don't like hearing your sick. Sorry. Feel better soonest sweet girl. Hey now that's what I'm talking about. Yum on the summer drinks. Uh huh, yesum, gonna hafta try me some. Ohh...what a trooper you are. Great post with drinks for the weekend. Maybe this Agua de Jamaica will help you feel better sooner! Yumilicous! I love girly fruity drinks! I'm with Joanne, Tequila will either cure you or kill you....lol....I do hope you feel better soon, summer is a bad time to be feeling down..and thank you for these great drink recipes! Hope you're feeling better. I have been away and haven't been out and about myself lately. Absolutely gorgeous drink pictures, especially the last two. I am so sorry you're not feeling well - darnit! Beautiful photos of this drink! I've been posting quickies this week too, just so busy at work! Oh ya...and feel better my friend!!! OK, NOW you're speaking my LNAGUAGE!! Yum!!! Yeah, that stinks whenyou just feel puny like that. Get better soon! Love this! 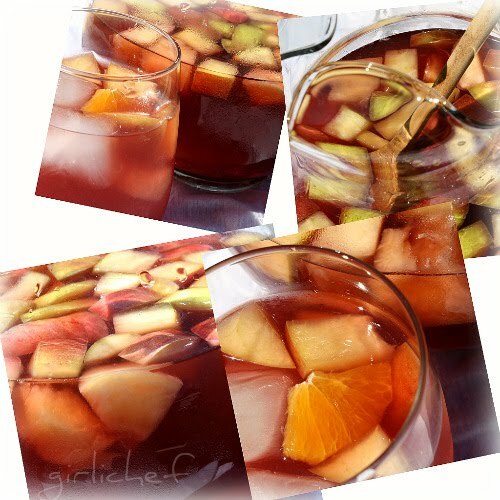 Also do a similar recipe for a fruit ice tea for the kids to enjoy.